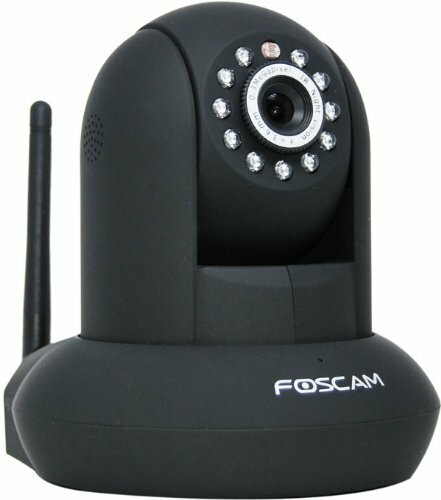 Foscam F1891W Wi-Fi infrared color video and image baby monitor. Also available to shipping outside the USA. Weighs 4 pounds and is number 2 in the security and category and also number 2 in the surveillance category on Amazon. This Foscam baby monitor has a 640×480 pixel resolution and a f2.4 infrared lens to give a bright picture in the dark. It received a 4.1 star rating from over 5000 customers. You connect this camera to your wi-fi device and through that connection you can watch and operate it on your Iphone, Tablet or Computer. Although it is not really an outdoor camera, it can be used as long as you keep it out of the rain and don’t let it get wet. For the price you pay you get a pretty decent product, but do not expect high definition pictures. What we read is that is not easy to setup without a little knowledge on how to set up a device to your Wi-Fi, but with so many people using these devices there must be someone who can help you. In case you need help there is a help desk available that gives in most of the cases good help to install the camera. In some more complicated situations they needed to call in the help of a more experienced technician. There is a newer model available, but there are people who send it back after purchasing it because they mentioned that the older model performed better, but we could not find any proof of that. With about 80% 5 and 4 star ratings from over 5000 customers this Foscam baby monitor received some good ratings. The biggest problem we found was that is was hard to install it on the wi-fi. The firmware is developed for Microsoft so this baby monitors two way will only work with internet explorer and no programs like fire-fox, Chrome or Safari according to one review I read. Try adjusting the lens manually by turning it. This is not clearly stated in the manual. The power adapter has a 100-240 volt rating and thus can be used all over the world. Camera can be installed up side down and has the option to rotate the view so you can see it right.